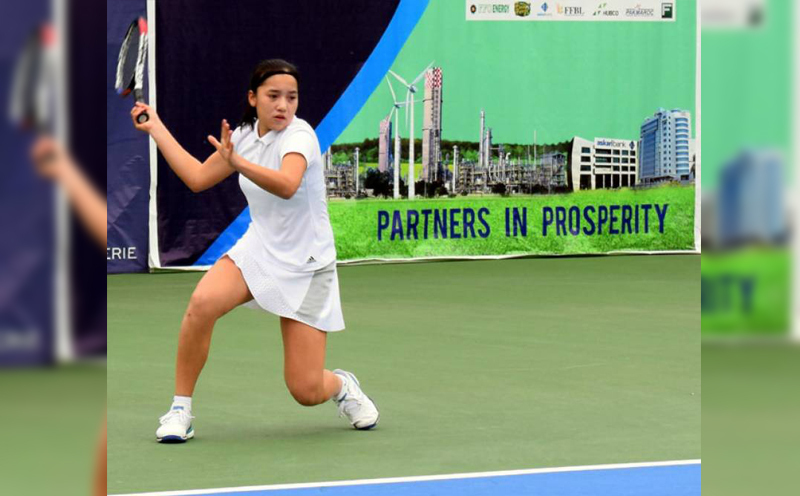 ISLAMABAD: Unseeded Soo Han Jang of Korea stunned top seed Mina Toglukdemir (TUR) in straight sets in the Syed Tajammul Abbas ITF Pakistan World Junior Ranking Tennis Championship 2019 matches here at Senator Dilawar Abbas PTF Complex. In other upsets of the day, unseeded Korean Ji Hyun Kang shocked second seed Rosaleen Alioussef (RUS) in straight sets while unseeded Russian Arina Valitova beat fourth seed Bee Francesca Acena (PHI) in a thrilling three-set match while unseeded Hong Kong’s Kit Yi Kaye Au-Yeung sidelined fifth seed Renee Marie Acena of Philippines in straight sets. In boys singles, top seed Huzaifa Abdul Rehman continued his winning streak as he eliminated German Luca Emanuel Knese in straight sets 6-3, 6-4 whereas second seed M Nauman Aftab of Pakistan lost his match in the pre-quarterfinals against Togan Makzaume of Turkey in straight sets. Another exciting match of the day was played in pre-quarterfinals, where unseeded Thai Taentawan Majoli beat seventh seed Ali Alshati of Kuwait. Both the players displayed excellent tennis by playing cross court forehand and backhand drives with combination of some down the line winners. Fifth seed Shoaib Khan of Pakistan was lucky when his opponent Tin Tran of Vietnam retired hurt due to knee injury at 3-0. Shaoib Khan/Huzaifa Abdul Rehman beat Cameron Austin Chang (USA)/Dogeon Park (KOR) 6-2, 6-1; Ali Alshati (KUW)/Essa Qabazard (KUW) beat Tamerlan Kalkenov (KAZ)/Soo Hyun Kang (KOR) 6-4, 4-6, 10-8; Berk Ulas ENC (TUR)/Togan Makzume (TUR) w/o Tin Tran (VIE)/Hai Truong Vo (VIE) Abdullah Adnan (PAK)/Ahmed Kamil (PAK) beat Bader Alabdullah (KUW)/Talal Alabdullah (KUW) 6-3, 7-6(5). Anjalika Kurera (SRI) beat Jyun Yi Lee (TPE) 6-2, 6-0; Soo Ha Jang (KOR) beat Mina Toglukdemir (TUR) 6-1, 6-3; Arina Valitova (RUS) beat Bee Francesca Acena (PHI) 4-6, 6-0, 6-3; Hannah Seen Ean Yip (MAS) beat Zoha Asim (PAK) 6-2, 6-3; Kit Yi Kaye Au-Yeung (HKG) beat Renee Marie Acena (PHI) 6-0, 6-1; Ayesgul Mert (TUR) beat Chloe Chong Zhi Jing(MAS) 6-1, 6-0; Li Hsin Lin (TPE) beat Shima Durab (PAK) 6-2, 6-2; Ji Hyun Kang (KOR) beat Rosaleen Alioussff (RUS) 6-0, 6-1, girls’ doubles quarterfinals: Kit Yi Kaye Au-Yeung (HKG)/Erica Kanna Hagi (HKG) beat Rosaleen Alioussff (RUS)/Aysegul Mert (TUR) 6-2, 6-0; Soo Ha Jang (KOR)/Ji Hyun Kang (KOR) beat Emma Jouy (CAL)/Mina Toglukdemir (TUR) 6-4, 2-6 10-5.